Rescuers carry a man hurt in Friday's blast in Peshawar. Islamabad, Pakistan (CNN) -- Pakistani troops have seized a key village in the Taliban stronghold of South Waziristan as they stepped up their offensive against militants in the country's northwestern region. "Kotkai village has been captured by the military," said the official who did not want to be named because he is not authorized to talk to the media. 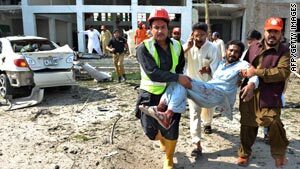 Kotkai has been a major target because it is the hometown of the Pakistani Taliban's leader Hakimullah Mehsud, as well as of Qari Hussain, believed to be behind some of the deadliest suicide bomb attacks in Pakistan. The development comes a day after the military said it had captured one of the heights overlooking Kotkai. The capture came as 25 people were killed Saturday when a suspected U.S. drone struck a village in the same region, local officials said. Two missiles hit a militant hideout in the village of Damadola, in the border district of Bajaur, a Pakistani military and political officials said. A local official told CNN the missile attack killed the nephew and son-in-law of Mawlanna Faqir Mohammed, the Taliban commander in Bajaur. Mohammed, himself, appears to have escaped the assault. U.S. officials do not comment on suspected drone strikes against militant leaders, which have caused tension between Pakistan and the United States. Three people were also killed in northwest Pakistan Saturday when hostile fire brought down a military transport helicopter. Senior military officials said two pilots were injured in the crash, which occurred around sunset and was under investigation, a military spokesman said. Speaking on the condition of anonymity, an intelligence source and a local political official said the helicopter was brought down by hostile fire. The military says it has been facing stiff resistance a week after launching its long-awaited offensive against Taliban militants in South Waziristan. In its latest update on Saturday, made before the helicopter crashed, the military said three soldiers and 21 militants had been killed over the last 24 hours. It also said about 167,000 people have been displaced from their homes in the war-torn region. As the fight rages in Taliban strongholds, militants have launched attacks in other areas the country. The death toll from three militant bombings Friday rose to 26, police said Saturday. CNN's Nasir Habib contributed to this report.